SALT LAKE CITY (AP) The Utah Jazz struggled from long range. They were on at the free-throw line. Donovan Mitchell scored 28 points, and the Jazz beat the Sacramento Kings 103-97 on Saturday night for their ninth straight victory. 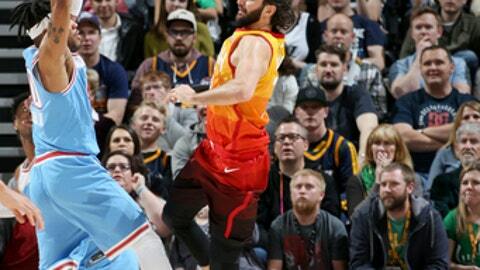 Rudy Gobert had 22 points and 13 rebounds for Utah, and Ricky Rubio added 14 points, nine rebounds and five assists. The Jazz (40-30) won for the 21st time in their last 23 games. Sacramento went 14 for 21 from 3-point range, but Utah made 31 of 38 at the line. Gobert went 8 for 10 as six different Jazz players shot at least four free throws. The free throws helped make up for a disparity on the perimeter. Utah went 6 for 24 from beyond the arc, and Sacramento was 9 for 14 on foul shots. The Kings (23-48) lost to the Jazz for the third time this season. Buddy Hield scored 23 points, and Bogdan Bogdanovic finished with 12. De’Aaron Fox made a free throw and dunked off a pass from Garrett Temple to rally the Kings into a 94-all tie with 1:11 remaining. But Joe Ingles, Rubio and Gobert each made two free throws to make it 100-94 with about 23 seconds to go. Temple then made a 3-pointer for Sacramento, but Ingles made another foul shot and Gobert scored to help Utah close it out. Ingles finished with 14 points, nine assists and seven rebounds. Fox and Temple each had 11 points for the Kings, who are 5-5 in March. ”Finding our identity is something we’re finding late, but it’s better to end on a better note,” Hield said. Kings: Hield has made 10 3-pointers over his last two games while shooting 55.6 percent from the perimeter. … Sacramento scored 15 points off Utah’s 10 first-half turnovers. … The Kings outscored the Jazz 56-15 in bench points. Jazz: Ingles made three 3-pointers to push his season total to 179, breaking the Jazz record of 178 set by Randy Foye during the 2012-13 season. … Utah finished with a 48-33 rebounding advantage. … The Jazz have won their last 16 games when Gobert records a double-double. Gobert is making a case for the NBA Defensive Player of the Year award. He blocked four shots against the Kings, and Snyder said there isn’t a better defensive player in the league right now. Gobert took it one step further. He feels like he is in a class by himself on defense. Jazz: Host the Hawks on Tuesday.